Cheese: Rancid Radioactive Blue Charm: ?? Caught off guard while frolicking nearby, this mouse was covered in a layer of Crude Pollutinum and raw Chromate spill-off from recent trap experimentation, mutating him by drastically increasing his size. If that wasn't enough, the fusion of Crude Pollutinum and Chromate has crystallized and formed a hardened shell over most of his body. 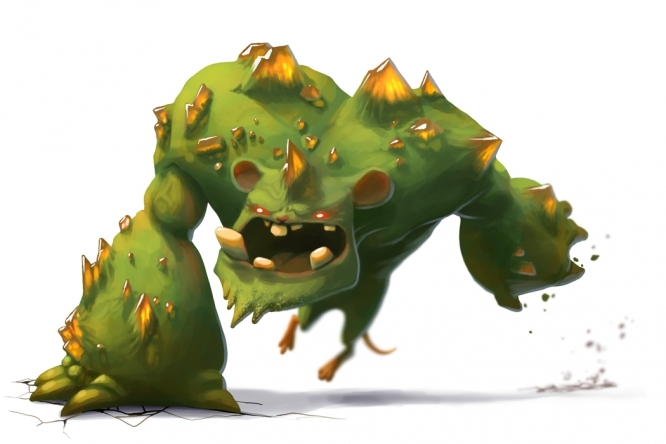 The Mutant Mongrel Mouse is a breed of mouse found in the Toxic Spill, for hunters of rank Duke/Duchess and above. Mutant Mongrel mice are especially attracted to Rancid Radioactive Blue cheese, to the point that any other kind of cheese will simply not suffice. Hydro type traps such as Oasis Water Node Trap or Phantasmic Oasis Trap are effective against the Mutant Mongrel Mouse. The Mutant Mongrel Mouse drops the Mutant Mongrel Egg and the Toxic Spill Egg during the annual Spring Egg Hunt. Released on 21 January 2014 as part of the Toxic Spill content. This page was last edited on 22 May 2017, at 17:42.